Many individuals are concerned about risks. Here are some basic things you can do to protect yourself. First, have a meeting with your insurance agent to make certain you have sufficient liability insurance. Ask about umbrella coverage for your automobiles and your home. Get at least $1,000,000 in liability coverage. Second, if you have a family business, think about a succession plan. Most family businesses fail after the death of the person who started them. The reasons are varied, but most of them come down to poor planning. Third, consult a financial advisor. Find a fee-based advisor who will review your retirement plan. You need to know whether your income and your assets are sufficient to fund your retirement. Fourth, think about your family. Do any of your loved ones have special needs? Do any of them have financial troubles? Have you planned your estate in a way that supports them? Fifth, take advantage of any public benefits you are entitled to receive. Go to benefits.gov and see if you’re eligible for any federal, state or local benefits. When you ask about the State taking your home, you are asking about Medicaid estate recovery. The general rule is this: if Medicaid pays your nursing home expenses, then it will file a claim in your probate estate. Medicaid regards its payments as a loan. For most people, the most valuable asset remaining is their home, so Medicaid targets the home when trying to collect on the debt it thinks you owe. The reason for this is because you spent-down (or did something else) with your countable assets to get on Medicaid in the first place. The only things left are your exempt assets and the home is the most valuable exempt asset. That’s why the home is targeted. A person of any age living in a facility or medical institution outside their own family’s home. A person 55 years of age or older who is in a home or community based program. For example, a nurse that comes to your home to help you take your medication or change bandages or a person that comes to your home to help you with bathing or getting dressed in the morning. At this time, Georgia exempts any estate from Medicaid estate recovery if the value of the estate is less than $25,000. Even if the estate’s value exceeds $25,000, Georgia will not enforce any claim while either spouse is living. If you are survived by a dependent child who is blind or has a disability, then estate recovery is delayed until your blind or disabled child is deceased. If the State enforces a claim, it will be against assets owned by the nursing home resident at the time of death. The claim is presented in Probate Court as a priority creditor claim. 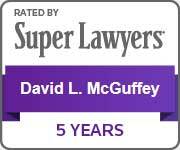 David L. McGuffey has helped hundreds of families plan for and respond to Medicaid estate recovery. If you have questions about Medicaid estate recovery, or if you want to plan to minimize its effect, call us today.